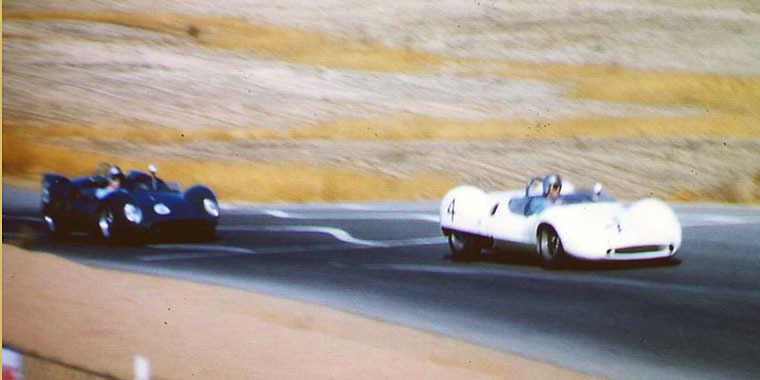 battled for the lead throughout the "L.A. Times Grand Prix held at Riverside on Oct. 15, 1961. Both drove Cooper "Monaco" cars powered by 2.75 liter "Indy Spec" Climax engines. Here, in John McCann's photo, Brabham leads as the pair brakes for Turn 7. Brabham drives the "finless" car owned by Hap Sharp. McLaren's Cooper is a factory entry. Brabham won the race, McLaren was 2nd. This battle presaged an equally close contest a week later at Laguna Seca between Stirling Moss and Dan Gurney in Lotus Mk.19s. Moss won that struggle, with Brabham and McLaren finishing 3rd and 4th. At Riverside, both Moss and Gurney were slowed by mechanical problems. All photographs and text are the property of John McCann and are protected under United States and international copyright laws. All rights are reserved and the images and/or text may not be digitized, reproduced, stored, manipulated, and/or incorporated into other works without the written permission of the photographer, John McCann.